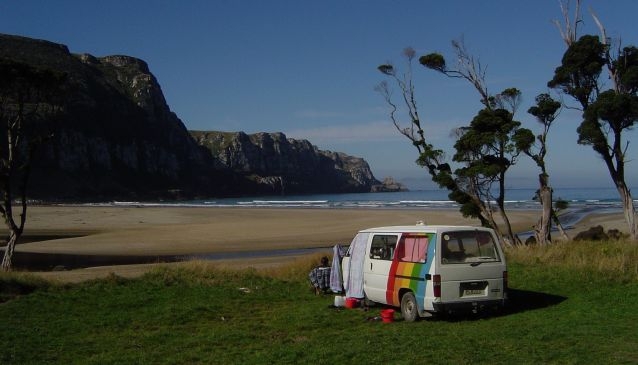 The New Zealand roads are full of them ...campervans that is. From the luridly-coloured hired 'Spaceships' to privately owned campers exhibiting every stage of dilapidation - these vehicles carry folk intent on getting off the beaten track while seeking the absolute freedom which can only be found from following no schedule but their own. Road-tripping heaven is made complete by the inclusion of more campsite options than there are sheep (possibly an exaggeration but you get the idea) and a multitude of ways to keep the costs down. 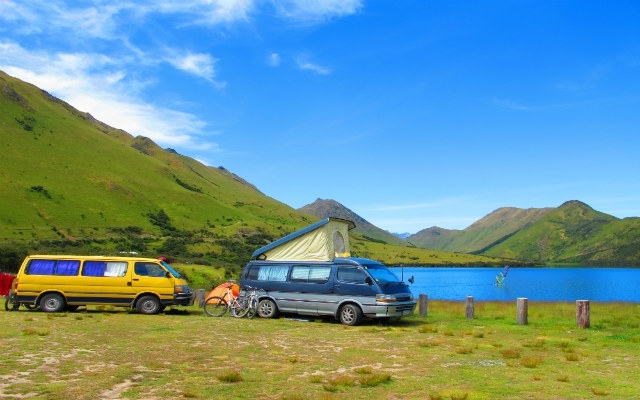 The first time I travelled around New Zealand in a van, I spent a small fortune equipping it from the camping shops and specialist outdoor stores in Auckland. Three trips on, I'm wiser and can now source all I need for around NZ$50 - $75 and that includes all sorts of extra little treats such as a fishing rod to catch my dinner and a comfy camp chair. Last time around, the van I bought from the Backpackers Car Market in Christchurch came already equipped with most of the essentials as is typical when backpacker sells to backpacker. This gave me the luxury of heading straight out knowing I could gather the other little bits and bobs as I went without paying the inflated prices of the city. New Zealand is a gold mine for budget and second-hand equipment if you know where to look. Op Shops - Charity stores found countrywide with high concentrations in Christchurch, Invercargill and Dunedin. Army surplus - Often new, typically cheap and invariably supplying kit designed to be highly durable. The Warehouse - New Zealand's number one budget chain store. Hostel notice boards - Backpackers moving on will often be willing to part with all kinds of kit at bargain basement prices. Backpacker Car Market - There is one in Auckland as well as Christchurch – often with a good choice of used or budget priced new equipment. Mitre 10 - Hardware stores full of all kinds of cut prices goods. Owning a vehicle anywhere attracts various legal responsibilities - New Zealand is of course no different. Vehicle licensing - the equivalent to UK road tax. Warrant of fitness (WoF) - the equivalent to the UK MOT. Road user charges (RUC) - if you buy a diesel vehicle you will notice you pay significantly less for fuel. Instead, your road user contribution is collected through 'road user charges' calculated on your vehicle's size and weight. Change of ownership - legal transference of ownership. Vehicle Information Report Check (VIR) - to ascertain if the vehicle you are buying has any outstanding fines which you inherit once ownership is transferred. Insurance - Not compulsory and therefore tempting to skip but just be ready to dish out thousands of dollars if you do have even a relatively small prang. Insurance can be taken out in 3-monthly chunks. AA Membership (Vehicle recovery service) - Another oh-so-tempting-to-skip cost but here's the thing (and I learned this the hard way).......New Zealand breakdown scenarios will typically see you stranded somewhere isolated, hours from anywhere, which may well lead to extortionate towing costs that could easily exceed the value of your van. Mechanical check - If you have some mechanical savvy you can skip this one but otherwise you may well be investing your limited budget on a lemon. Mechanical checks are relatively low cost and could save you a lot of heartache. Again, I learned this the hard way and no way now would I ever buy a vehicle without getting it checked. First stop......i-SITE. 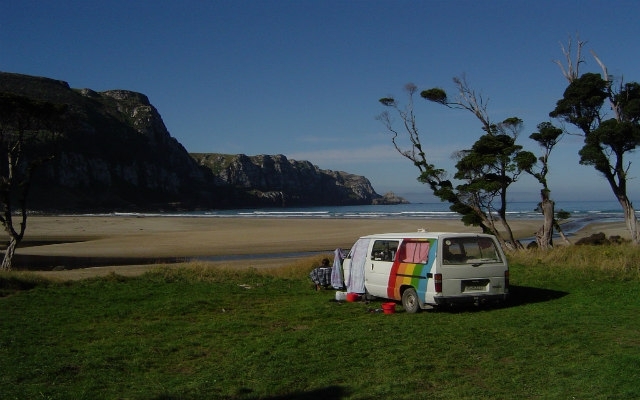 If I had to give only one tip for campervan travel this would be it. These wonderful tourist information centres, which seem to be found even in the tiniest of settlements, are crammed with all kinds of treasure for the budget traveller and should be the first port of call on arrival every time. Thereafter, each i-SITE's local section will be full of individual leaflets for campsites in the area usually complete with full-colour photos so you can pick your ideal. Also have a word with the staff because sometimes the tiniest, tucked away, privately-owned gems don't appear on any tourist literature. They will also be able to advise you of any council-run freebie schemes or low cost options such as the lovely Orton Bradley Park camp at Lyttleton. 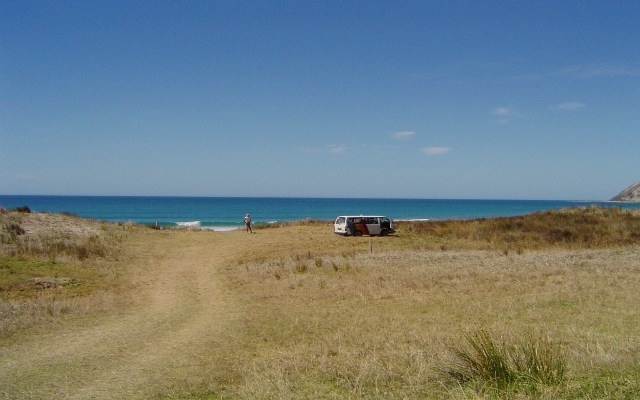 Department of Conservation (DOC) sites – always low cost, sometimes free and invariably in the most stunning natural spots including absolute beach-front, lakeside or deep in the forest, DOC sites are for me the way to go. There are so many - more than 120 on the South Island alone - which means outside of high season I've often had them all to myself. Payment, if there is any, is typically via an honesty box system as you enter and even the most basic have at least toilets and some water source. Pick up a map and DOC campsite location leaflet at i-SITEs or DOC offices. My 5 STAR Driveway NZ - a new scheme which matches those looking for a spot to park up with owners who have a driveway/field/courtyard available and want to earn a few dollars. The treasure-hunt approach - dotted everywhere and found only by word of mouth or stumbling across a partly hidden rickety sign, are the small, privately-owned, often cream-of-the-crop sites. Happy to check out where all manner of unsealed roads went, I became an expert at sniffing these out and ended up camping in all kinds of idyllic places for next to nothing. Cut down on wasted food - a van in summer is like an oven and food spoils quickly. I found a gas/12v cool box (or chilly bin as they are called in NZ) to be money well spent. The cheapest shop - Pak'N Save by a long shot. Food for free - as a seafood fan I was in heaven. I'm no fisherwoman but fish practically jump on your hook here and a local Maori couple I met at a camp-site showed me how to dive for and locate crayfish, kina (sea-urchin) and paua as well as how to dig for pipi (shellfish) and cockles. A feast for free. The last word.........buy your van on the South Island and sell on the North and/or buy in low season and sell in high.....you could then actually find yourself making a profit.